New NSF paleo research claiming Arctic was warmer fails to take major ocean circulation changes 3 million years ago into account | Watts Up With That? The Arctic was very warm during a period roughly 3.5 to 2 million years ago–a time when research suggests that the level of carbon dioxide in the atmosphere was roughly comparable to today’s–leading to the conclusion that relatively small fluctuations in carbon dioxide levels can have a major influence on Arctic climate, according to a new analysis of the longest terrestrial sediment core ever collected in the Arctic. “One of our major findings is that the Arctic was very warm in the middle Pliocene and Early Pleistocene–roughly 3.6 to 2.2 million years ago–when others have suggested atmospheric carbon dioxide was not much higher than levels we see today,” said Julie Brigham-Grette, of the University of Massachusetts Amherst. Brigham-Grette is a National Science Foundation- (NSF) funded researcher on the sediment core project and a lead author of a new paper published this week in the journal Science that describes the results. The data come from the analysis of a continuous cylinder of sediments collected by NSF-funded researchers from the bottom of ice-covered Lake El’gygytgyn, pronounced El-Guh-Git-Kin, the oldest deep lake in the northeast Russian Arctic, located 100 kilometers (62 miles) north of the Arctic Circle. The drilling was an international project. 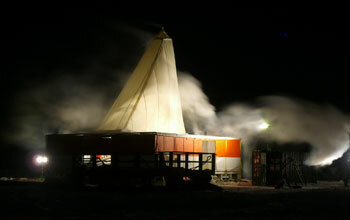 Drilling took place in the early months of 2009. The Earth Sciences and Polar Programs divisions of NSF’s Geosciences Directorate funded the drilling and analysis. Analysis of the sediment core provides “an exceptional window into environmental dynamics” never before possible, noted Brigham-Grette. “Lake E,” as it is often called, was formed 3.6 million years ago when a meteorite, perhaps a kilometer in diameter, hit the Earth and blasted out an 18-kilometer (11-mile) wide crater. The lake bottom has been accumulating layers of sediment ever since the initial impact. The lake also is situated in one of the few areas of the Arctic that was not eroded by continental ice sheets during ice ages. So a thick, continuous sediment record was left remarkably undisturbed. Cores from Lake E reach back in geologic time nearly 25 times farther than Greenland ice cores that span only the past 140,000 years. Important to the story are the fossil pollen found in the core, including Douglas fir and hemlock, clearly not found in this part of the Arctic today. The pollen allows the reconstruction of the vegetation living around the lake in the past, which in turn paints a picture of past temperatures and precipitation. Another significant finding is documentation of sustained warmth in the Middle Pliocene, with summer temperatures of about 15 to 16degrees Celsius (59 to 61 degrees Fahrenheit), about 8 degrees Celsius (14.4 degrees Fahrenheit) warmer than today, and regional precipitation three times higher. “We show that this exceptional warmth well north of the Arctic Circle occurred throughout both warm and cold orbital cycles and coincides with a long interval of 1.2 million years when other researchers from the ANDRILL project have shown the West Antarctic Ice Sheet did not exist,” the authors point out. Hence both poles share some common history, but the pace of change differed. Along with Brigham-Grette, her co-authors Martin Melles of the University of Cologne, Germany, and Pavel Minyuk of Russia’s Northeast Interdisciplinary Scientific Research Institute, Magadan, led research teams on the project. Robert DeConto, also at the University of Massachusetts, led the climate-modeling efforts. These data were compared with ecosystem reconstructions performed by collaborators at University of Berlin and University of Cologne. The Lake E cores provide a terrestrial perspective on the stepped pacing of several portions of the climate system through the transition from a warm, forested Arctic to the first occurrence of land ice, Brigham-Grette says, and the eventual onset of major glacial-interglacial cycles. “It is very impressive that summer temperatures during warm intervals even as late as 2.2 million years ago were always warmer than in our pre-Industrial reconstructions,” she added. Minyuk notes that they also observed a major drop in Arctic precipitation at around the same time large Northern Hemispheric ice sheets first expanded and ocean conditions changed in the North Pacific. This has major implications for understanding what drove the onset of the ice ages. The sediment core also reveals that even during the first major “cold snap” to show up in the record 3.3 million years ago, temperatures in the western Arctic were similar to recent averages of the past 12,000 years. “Most importantly, conditions were not ‘glacial,’ raising new questions as to the timing of the first appearance of ice sheets in the Northern Hemisphere,” the authors add. This week’s paper is the second article published in Science by these authors using data from the Lake E project. Their first in July 2012 covered the period from the present to 2.8 million years ago, while the current work addresses the record from 2.2 to 3.6 million years. “This latest paper completes our goal of providing an overview of new knowledge of the evolution of Arctic change across the Western borderlands back to 3.6 million years and places this record into a global context with comparisons to records in the Pacific, the Atlantic and Antarctica,” Melles points out. The Lake E paleoclimate reconstructions and climate modeling are consistent with estimates made by other research groups that support the idea that Earth’s climate sensitivity to carbon dioxide may well be higher than suggested by the 2007 report of the Intergovernmental Panel on Climate Change. What else happened 3 million years ago? A major change in ocean circulation, that’s what. The Isthmus of Panama, also historically known as the Isthmus of Darien, is the narrow strip of land that lies between the Caribbean Sea and the Pacific Ocean, linking North and South America. It contains the country of Panama and the Panama Canal. Like many isthmuses, it is a location of great strategic value. The Isthmus was formed some three million years ago during the Pliocene epoch. This major geological event separated the Atlantic and Pacific oceans and caused the creation of the Gulf Stream. So, three million years ago the ocean circulation patterns changed when the isthmus formed, which our intrepid researchers have not mentioned, because in their minds, it couldn’t be anything but CO2 that made it warm then. There’s no mention of this “most important geologic events to happen on Earth” in the NSF research that coincided with their paleo record. The long lag time has always puzzled scientists: Why did Antarctica become covered by massive ice sheets 34 million years ago, while the Arctic Ocean acquired its ice cap only about 3 million year ago? Since the end of the extremely warm, dinosaur-dominated Cretaceous Era 65 million years ago, heat-trapping greenhouse gases in the atmosphere have steadily declined (with the anomalous exception of the last century), and the planet as a whole has steadily cooled. So why didn’t both poles freeze at the same time? The answer to the paradox lies in the complex interplay among the continents, oceans, and atmosphere. Like pieces of a puzzle, Earth’s moving tectonic plates have rearranged themselves on the surface of the globe—shifting the configurations of intervening oceans, altering ocean circulation, and causing changes in climate. The development of ice sheets in the Southern Hemisphere around 34 million years ago seems fairly straightforward. The supercontinent of Gondwana broke apart, separating into subsections that became Africa, India, Australia, South America, and Antarctica. Passageways opened between these new continents, allowing oceans to flow between them. When Antarctica was finally severed from the southern tip of South America to create the Drake Passage, Antarctica became completely surrounded by the Southern Ocean. The powerful Antarctic Circumpolar Current began to sweep all the way around the continent, effectively isolating Antarctica from most of the warmth from the global oceans and provoking large-scale cooling. I think the researcher simply skipped over this important detail is pushing the idea that CO2 was the only issue. I’m sure Steve McIntyre will be interested in getting a look at the sediments and the dating methods to see if there are errors there. Lately, it seems that paleo research has made some very broad assumptions, and almost always in the favor of the theory. Good analysis Anthony. Too many of these so-called researchers have a narrow view. If the core data had been presented to someone like Dr Bob Carter who has had geological training and experience as well as experience with sediments then a useful paper would have resulted. It’s especially important at this time to publish anything one can in support of CO2 having a large effect on climate. However, in a few years they may be regretting it. The progression from an unimpeded Central American Seaway between Atlantic and Pacific oceans to the Isthmus of Panama that fully blocked that passage would seem to be something that computational fluid dynamics computer modeling could provide valuable insights into changes in the circulation patterns and a better understanding of climate effects. Does anyone know if such modeling has been explored? If so, do you know of a link to the data/model or a paper that discusses the comparative results? Geology – nature writ in the brute force fashion of, say the Alabama offensive line or the Stanford defensive line – interjects itself to yet again to change the habitability of the Earth. A few little ppm of CO2 has almost nothing to do with it, except of course to provide life for the plants that in turn power the animal world. These idiots are a disgrace to the science and profession. I presume we should not only think of the researcher skipping over this important detail – so did the other authors and the peer reviewers. It must take a lot of doing to get so many highly qualified scientists to all skip over such an important event. It is often necessary to choreograph such group skipping to the same tune. Speaking of warming, explorer raises global warming awareness by freezing to death. Sad. No doubt they needed to find a sexier (more fundable) interpretation. For several years I have been trying to understand why the important (BU, Tufts, U Mass etc..et al) studies on the age of the ice in the Beacon Valley (a hanging valley) have not received more attention. The matter of interest is the fact that the ice was trapped in the hanging valley and because it could not move due to the main glacier wall blocking therefor it is a very old remnant. Investigations over the past decade represent reasonable proof that the trapped ice has survived in essentially the same extent for possibly several million years…. through several glacial cycles. One paper suggests Miocene. I find that this interpretation of the ice data goes against the politic and is well known but rarely discussed in AGA climate dialogues………. Inconvenient having reality based data from Antarctica that refutes the models? http://bulletin.geoscienceworld.org/content/114/6/718 This article has been cited 145 times in scientific literature. So it was hot but cold enough for glaciers……and in the period of relevance has “never” been warm enough to reduce the ice in this hanging valley. HMMMMM.. I must continue to think about the issues this data presents. Looks like it took a bit of money to get this core. So they had to skip a bit. Then they went skipping all the way to the bank. The data itself is likely to be a treasure trove for true scientists. They likely won’t skip, and instead will work in a most meticulous manner. Furthermore, they will, in private, conduct a truer and more thorough peer review, bringing up all sorts of questions, including some questions they may first read while visiting WUWT. This may occur with this study. However let’s give credit where credit is due. These scientists managed to convince fat-cats to part with their filthy lucre, and got some really cool data from a God-forsaken part of the arctic. At the same time, we ought not allow the fat-cats to then use this data for political ends. If we are not careful, something about curly light bulbs will be inserted into the Constitution of the United States. “A significant body of water (referred to as the Central American Seaway) separated the continents of North and South America, allowing the waters of the Pacific and Atlantic Oceans to mix freely. Beneath the surface, two plates of the Earth’s crust were slowly colliding, forcing the Pacific Plate to slide under the Caribbean Plate. The pressure and heat caused by this collision led to the formation of underwater volcanoes, some of which grew large enough to form islands as early as 15 million years ago. Meanwhile, movement of the two tectonic plates was also pushing up the sea floor, eventually forcing some areas above sea level. Which means there cannot have been a sudden shift 3 million years ago. My reading of your post is that you imply it. The previous post about the same paper had a piece about Zwally before it, which did not have anything to do with the paper. Why not review the paper itself instead of involving distracting irrelevancies? Warmer temperatures than today, but with the same level of CO2 as today, leads most parsimoniously to the hypothesis that CO2 has little or nothing to do with warm temperatures. The authors have merely taken the ruling theory and qualitatively interpreted their results in terms of it. This happens all the time in science. It’s usually OK, because it gets the result in circulation. Typically what happens is that when the ruling theory is overthrown by a better theory, the results get re-interpreted and end up meaning something very different than the original workers conceived. This happens all the time in science, too. In these cases the previous theory is typically unable to provide unique explanations. So, qualitative conclusion mongering gets by because it seems reasonable, even if the conclusion cannot be quantitatively demonstrated. That is the situation of Julie Brigham-Grette, et al., here. They’ve just inserted their result into the accepted theory, and made qualitative hand-waving conclusions without being able to quantitatively demonstrate any of it. Common in science, but now made socially oncogenic in its grotesquely politicized milieu. It’s not free of social or policy consequences. Let no one say that some climate model provides a quantitative verification of Julie Brigham-Grette’s conclusion. Climate models make errors orders of magnitude larger than increased CO2 forcing. They are unable to quantitatively verify anything. It isn’t until one accepts as gospel the AGW doctrine that tunnel vision (and tunnel everything else) begins to banish scientific reasoning. I downloaded the temp data from this study earlier today. This is the reconstruction of what the warm month (let’s say July) was over the period compared to today versus all the CO2 estimates in the period (shown at 3.0C per doubling). I don’t know why it was 8.0C warmer in the summer than today when CO2 was in the 280 ppm range nor why it dropped to +/- 2.0C from today at 2.2 Mya when CO2 was in the same range. (also note that the period in this chart (from 4.0 Mya to 1.5 Mya) had more-or-less some of the highest CO2 estimates over the past 24 million years getting up to 418 ppm. All other periods going back 24 million yeas would be lower than this (except for the past 40 years I guess). And this just happens to be the exact time period when the recent ice ages started. hmm, highest CO2, ice ages start, no correlation to the summer temps from this Lake. double hmm). “Mr Goodeve-Docker, who ran the Purple Cactus comedy agency in Hammersmith and lived in Ealing, had been attempting what he called a “frankly nutty adventure” in memory of his grandfather Patrick Pirie-Gordon, who died two years ago. I don’t see anything about global warming awareness????? The comments on the article are revealing. If correct they speak of a uselessly wasted life with serious injury. Not a good look. A bit OT, but I’d be interested to see what scientists theorize the ocean currents were like before the isthmus of Panama formed. It is odd to imagine a North Atlantic without a Gulf Stream. Anyone have any links to good papers about the topic? It seems to me a Pacific version of the Gulf Stream might have more power, and go blasting north through the Bering Straits, providing the sea levels were high. How greatly would weather patterns change? Could it cause/contribute-to the extinction of the mammoths? I am NOW entirely in favor of shutting down the National ‘Science’ Foundation. 1) Current ‘Officers’ and all employees, are rendered to the GITMO facility pending dispensement proceedings. 2) A Constitutional Amendment calling for a ‘Separation of Science and State’ has to be entered, voted on, and enacted into Constitutional Law. Oh BTW, Obama issued yet another ‘Super Duper Secret’ Executive Order to ‘Open Data’ for all and all at least if you are a ‘machine’ and you have ‘machine readable’ capability. No choreography required. The peer reviewers of such papers mostly appear to be Green, everyone else has been indoctrinated over the years to give the Green Nod (or else No Funding) and of course it’s still a necessity to be seen as keen to Save the Planet. I think you’ll find the “highly qualified scientists” don’t see these papers at all until they are printed and the headline has been grabbed and utilized by the fear-mongers. Good God! Even if the data is taken at face value the conclusion is clearly subjective. It would read in full: ‘Given that we are convinced that CO2 is the only important variable for global temperatures, the results suggest that the earth system response to small changes in CO2 is bigger than suggested by models’. In layman’s terms that would read: Regardless of what the data say, they support the idea of CO2 driven, catastrophic global warming. I get the impression that once the lynch mob have got their rope around the neck of CO2 they don’t really feel obliged to go looking for anyone else. Ocean circulation is a most important heat conveyor and a heat storage. Well, at least she gets that its not about Milankovitch. And of course they never even consider the possibility that rather than indicating that climate sensitivity is even greater than the models suggest, utterly ignoring compelling evidence from the ice cores, CO2 was actually lagging temperature in the downward trend. Let’s forgive the breathless thankfulness that the lake escaped glacial scouring because hardly anyone can get their head around the reality that Siberia almost entirely escaped glaciation during the last stadial. However, I beseech all would endlessly repeat the mantra that the closure of the Isthmus of Panama had anything to with the Pleistocene to at least check the modern paleogeographic reconstructions of Ron Blakely and Scotese. To the best of our knowledge the Isthmus of Panama was more constricted 50 million years ago at the PETM than Indonesia is today. And if you would argue that blockage of zonal ocean circulation causes snowcone episodes, check out the reconstructions for the Permian, Ordovician, and Precambrian glaciations. The prevailing Green/Left view is that nothing of significance occurred in the world before they existed, so a collision between two continents 3 million years ago can hardly be expected to register. Everyone should realize that “closing the isthmus 3 million years ago” is both a long, slow evolution that occurred over a long period of time; AND a short sudden effective change in the currents worldwide. Above, someone showed that the isthmus would have been like Indonesia now: plenty of room for currents to flow from west to east, but more restrictive than an open path. Consider the “arc” of islands and narrow gaps up across the Aleutians: They are close to each other, but the Japanese currents isn’t really impeded by their presence. Instead, the Japanese currents flow across the side of the arc, curving down towards British Columbia, the west coast, and then towards Mexico. The arc of closely spaced islands going south from Florida towards Cuba is similar: the Gulf Stream isn’t impeded, but flow from the Gulf of Mexico into the Atlanta certainly is affected. Soooo… now they are once again proposing that doubling of CO2 may actually lead to 6C or more of warming? Gee… I thought with all of the latest research the sensitivity was trending lower and lower, well under 2C now. And how did they come to the conclusion that CO2 caused the warming and not the other way around? After all, there weren’t any humans driving SUVs around at that time. These people (climate scamicists) are so clueless and agenda driven it would be hilarious if not for the damage they are doing to our economy and well-being. If they are trying argue that warm arctic temperatures 3 million years ago were due to elevated CO2 levels why no analysis of whether decreasing CO2 preceded cooling temperatures at the studied location? Or rather, why no REPORTED such analysis, because if the site did show CO2 changes preceding temp changes, they would surely have reported it. “One of our major findings is that the Arctic was very warm in the middle Pliocene and Early Pleistocene–roughly 3.6 to 2.2 million years ago–when others have suggested atmospheric carbon dioxide was not much higher than levels we see today,” said Julie Brigham-Grette. But how can their ice core fail to produce a CO2 record when others do? Maybe they are just saying that modestly elevated CO2 3mya was an already established fact, not reliant on their new information. The crater was formed 3.6 mya, which they describe as already warm, so they aren’t saying anything about when or how the area got warm. That leaves when and how it got cold, which they ignore. Very suspicious. Warmist scientists are equally conveniently blind to the earlier effects of the opening of the Drake Channel between Patagonia and Antarctica whenever it suits them too. Of course, the equally obvious conclusion is that the level of CO2 has little, if any, influence on climate and that climate changes are driven by natural variation, the processes of which are presently not known or understood. Whenever one looks at the Paleo record, it is important to have in mind plate tectonics and land distribution since these play a major role in the interpretation of the record. Due to the vast amount of reserves of latent heat contained in the oceans, compared to that of the atmosphere, the Earth’s climate is driven by the oceans, and changes in ocean circulation patterns will, as suggested, be significant. Bingo Antony! These sediment researchers did a good job drilling in that location and documenting there finds but missed the main event of the Isthmus of Panama closing in their efforts to explain these super high Arctic temperatures. They plugged all the usual suspects in their computer models like CO2 etc. but missed out on the big one. This bloody single mindedness of the CAGW camp blindsided them. The hole idea of AGW is reminiscent of alchemy. What was the direction of causality? Did the increased CO2 cause the increase in warmth? The conventional view of Earth scientists has been that the Pliocene was a time of global cooling. A brief episode of warming and elevated CO2 during the overall cooling trend could have resulted from a change in ocean currents. The closing of the gap at Panama separated the Atlantic and Pacific Oceans changing the course of the currents. Hypothesis 1: A change in ocean currents (A) could have driven both the increase in CO2 (B) and the warming of the Arctic (C). In this hypothesis A drove B and C independently, If this hypothesis is incorrect and warming was caused by the increase in CO2, there remains the difficulty of accounting for the source of the additional CO2. Hypothesis 2: An alternative hypothesis would be that a change in the ocean currents (A) drove the outgassing of CO2 (B) and then the increase in CO2 drove the warming of the Arctic (C), which appears to me to be the point of the paper. The questtion then would be: Why the additional step? Why does A have to drive B and then B drive C? More problematical is the fact that mid-to late Pliocene warming was soon overtaken by further cooling and then ice ages. The long-term cooling trend seems to have resumed. This is consistent with hypothesis 1 but how is this explained by hypothesis 2? All this type of research is based on CO2 having a warming effect. This is highly unlikely because any planetary atmosphere will cool the surface, because of energy removal by the atmosphere to heat it, and that the GHE cannot work because of thermodynamic law violations. A more obvious reason for heating is increased insolation which is always discounted. So it was much warmer with the same CO2 level, it means that climate is even more sensitive to CO2.. my head will explode I think. My conclusion is, that climate does not give a damn about CO2 but hey what I know, I am not a climate scientist. Anthony — your analysis is interesting and probably higher quality than the near daily ration of climate crap we are subjected to from the mainstream media. Nonetheless, let me second Plain Richard in contending that the closing off of Pacific-Atlantic circulation by the closing of the “Panama Gap” in the Pliocene was likely a rather slow process. Fortunately, a beneficial result of the continental drift debacle is that modern geologists don’t claim they have a “settled science”, so discussions of things like the closing of that gap will generally tend to be conducted like real science rather than like a medieval religious argument where the losers a burned at the stake. I’d be interested in seeing more input from real geologists (I’m certainly not such, but I think there are some who read and post at WUWT) on exactly how, when, and on what time scale, the gap closed and what the likely impact would be on the climate of Arctic NorthEast Asia. The Panama Isthmus was indeed quite constricted well before 3.0 million years ago. But the Gulf-Stream-like ocean currents only need about 200 metres of ocean depth in order to flow properly as they do today. They are driven by the winds which flow East-west at the equator and by whatever continental shelf land constricts them to. There would have been a period when the Gulf Stream flowed up and over South America, through the constricted passage and directly into the Pacific. Where it would have then joined the Equatorial current of the ENSO. There would have a period where it got cut in two, some flowly to the west and the Pacifc and some of it getting diverted in the Gulf of Mexico up onto the eastern side of North America. When the Isthmus finally became less than 100 metres deep, the current Gulf Stream arrangement would have taken over, and isolating the Atlantic from the Pacific. Today they have different chemistry and temperature and sea surface height given the separation. How this affected the climate is difficult to say. In earlier time periods, the Eocene for example, it is easier to see how some of these currents kept the Arctic warmer but this period might have kept the Arctic actually colder until the Isthmus closed, after which it kept it warmer. This bit stuck with me from the *first* press release. If the Lake E sight has somehow managed to evade glaciation all of this time, it seems to me that it would be difficult to reason it is representative of what is happening else where in the arctic or what the real connection is. The Lake E site would seem to be exceptional in some way, unless they are arguing that Lake E is the exception that proves their rule. Ice sheets can only develop where there is enough precipitation to counteract sublimation. With the Arctic Ocean frozen there is no source of moisture for Siberia. The northern hemisphere ice sheets were confined to North America and NW Europe for this reason. Moisture was sourced from the Pacific and the North Atlantic, respectively. It really is amazing the way these guys seem to believe at an instinctive level that the earth is constant, except when man changes it. Another possibility is the narrowing of acceptable specialties within the Global Warming community. For years now they have been excluding geologists because geologists as a whole have been skeptical of the warmists claims. With no interaction between the warmists and geologists, it’s possible that none of the researchers or the reviewers were aware of the Isthmus of Panama forming during this critical period. 1) What is the evaporation rate of open sea water at -2C and moving air [10 mph -> 4.5m/s] at air temperatures of, say, -10C [20% relative humidity]? 2) What is the “evaporation [sublimation] rate” of water ice at -2C and moving air [10 mph -> 4.5m/s] at air temperatures of, say, -10C [20% relative humidity]? 3) What are the parameters and what is the rate of “Arctic Ice” sublimation? I’d rather make a simple mistake than be a member of the Genocidal Warmistas, Steven. There’s stupid, and then there’s really, really supid. Maybe even criminally stuipid. Just because my website is hosted on a Russian web server doesn’t make it less legitimate or infested with malware. It’s 100% HTML5/CSS3 compliant and I don’t host/embed/engage in peddling malware – it would be stupid and Google and other web search engines would instantly remove me from the … top of their search results. Just because you’ve found just one (!) outdated clause doesn’t mean the entire article is outdated or wrong. Sounds like you a hypocrite. Best regards, the author of this website. Simply follow the money. If they, and the reviewers, don’t toe the line, they don’t get their grants. Therefore, this garbage. This study brings closer the day when the utter fallacy of starting a study with the assumption that CO2 drives temperature will be inescapable even to the activist elite. CO2 drives nothing except the AGW political agenda. Is is such a gigantic intellectual leap for these people to imagine that maybe, just maybe, it was temperature that historically was driving CO2, instead of the other way round. Such an inversion is a very simple mental step but still clearly a lot to ask of modern climate scientists selected primarily for Machiavellian political skill. Where did they get the idea that CO2 levels at the 3M to 2.2M years ago period was about the same level as now? Someone presumably has been able to do the research and published it. But if CO2 levels were about the same as now, where did all the extra CO2 come from? For a cert we weren’t around to burn coal or oil. There is the possibility that should not be ignored, even if to be discounted, that the earth’s poles have been well displaced from the present location. Consider the possibility that the N Pole was located in north eastern Canada, say 70 W, 70 N. A ring or reasonable width around there would include most of England, large chunks of northern Europe, eastern Canada and the US down to around perhaps St Louis – not to familiar with the geography of the middle of the USA. Pretty well all this area was glaciated, whereas Siberia and Alaska was not. Coincidence? possibly, possibly not, but what difference would this have made to climate elsewhere? Southern hemisphere the S Pole would have been 70 S, 110 E. Perth, WA, is about 31 S and 115 E. So while there would not be too much difference in longitude, Perth would have been about 51 south. Result weather would have been far cooler nd wetter than today. So would the rest of Australia, hence the ability of the large giant marsupials to survive. The opposite edge of the Antarctic would have been 20 degrees further north, but almost certainly still ice bound.